SRGMP LC was so good last week, it was downright scary! After being pummeled by some good natured PJs in half the show by a standup who came dressed as Chandamama, SRGMP switched to a spooky theme - the kids had to come out and sing something from a scary movie. And you know what tickled me the most? Time and again while a kid would be singing, a woman, dressed in white with loose black hair, would walk wordlessly across the stage holding a candle in her hand. This was a brilliant send up of classic Bollywood spookiness, second only to hearing a ghungroo in the night. Several spooky songs were sung - reminding me of times when I sat cowering in my seat cursing myself for watching a rerun knowing fully well what the movie was about. Such were the pressures of having to prove your manhood in those days. But I'm getting ahead of myself. Let's talk about the rishi-muni segment, shall we? Earlier on Friday, even though Head amiably tried to spin the show as one showcasing Religious Integration, the theme was as saffron as they come. I'm not trying to nitpick here - religion is an important sociological construct and the one you pick scarcely matters to me, but scattering a bunch of extras on stage as nodding rishis in bad wigs kind of sends out a one-track signal, don't you think? In that episode, poor Vasundhara got the long kiss goodnight. Much tear-shedding ensued. Even Wadkar sat around glumly with red eyes. This tightens the noose around the neck of the wonderful Anamika - who despite being the strongest singer among the bunch has to battle against her gender in terms of securing votes. And speaking of Anamika, a terrific touch of drama was added by the appearance of her father - you know, the one who Anamika quit over because of a heart-attack scare. I couldn't help but entertain myself with the possibility of some spontaneous drama were the dangerously wobbly arrow of doom to ignore Anamika's head entirely. Happily, no such thing happened. Dad went home smiling having gamely croaked a song to boot. Four contestants are left now - of which Aamir Hafiz took the most battering from the judges. In fact, at one point Sonu Nigam put him through the grinder for ignoring the judges while they were speaking. A black and white sankat moment ensued which Aamir hurriedly negotiated. Will the wobbly arrow favor him next week? Or will it ignore him and send him packing. Honestly, I couldn't care less. All I want is another theme that provokes over-the-top sets and guests. Fantabulous captions, Aspi --- unabomber and MF Hussain indeed :D . In the first half chandamama's low-brow humor was beginning to wear out its welcome. The horror themed second half was something else. 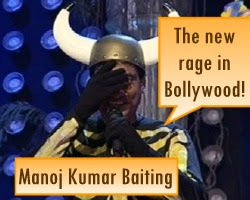 Raju Srivastav's bizarre costume, constant annoying laugh and multi various references to chudails and the weird set up the show itself was so amazingly bad that it was amazingly good. 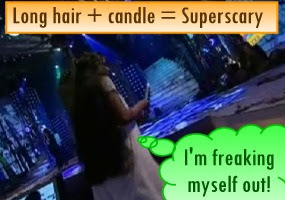 when the woman in white with long hair and candle trailed after anamika i was spooked --- in bafflement at the idea! the show plumbed new lows in tackiness and therefore new highs in entertainment (and wadkar's lata sycophancy --- sheesh)! This was certainly one of the worst shows of srgmp. I have a watched a few parts of VOI Chotte ustad, and its filled with gimmicks like this. My daughter and I were so relieved srgm didnt have such nonsense.My daughter was not amused (nor spooked?) by this weeks srgm. Goes to prove it entertained neither adults nor kids. Even I was really amused by that lady in white with a candle...she looked thoroughly bored and went thru it as if it was a drill. Aspi, how could u forget a photo of Wadkar running away when the bhooth appeared behind him!That should be archived! Btw,I was almost expecting the sadhus to suddenly get up and do a jig on Friday. What a pity they didnt. I loved Amir;s singing, but think he has reached the best he can do now. Requires much more training. Anamika is our family's favourite...and I hope she wins.Have u noticed she has been growing chubbier by the day. My husband says she used to sing like Alka Yagnik, now she has started to look like her too! i haven't seen last few episodes but gosh Anamika is getting SOOOOO overrated! i will miss Vasu, she was awesome, people just used her disability to bash her. I want Rohan or Tanmay to win. I agree...I feel like Aamir has shown us the best he's got and has been getting inconsistent. In my opinion, Anamika is by far the best singer on the show. I know it wasn't meant to be funny, but I found the lady in white to be hilarious. She looked very much out of place and like she didn't want to be there. I have to say with the eliminations we've seen so far, I think all the kids have had a graceful exit. I'm going to miss Vasundhara. She seemed to struggle a bit lately, but she deserved to stay longer than Aamir. All the other SRGMP-related sites seem to be discussing whether or not Sonu was too harsh on Aamir. Personally, I don't think so. But your thoughts? Great write-up Aspi! The captions, hillarious as always. I dont think RS was that funny...I've never found his comedy humorous. But nonetheless, he brought some entertainment (even though it was bad entertainment) to the show. I agree with Anu g, Anamika seems to get chubbier and chubbier...it's mean to say of a little girl but still. I've noticed another thing wiht girls in these types of shows...looks tend to take them futher than talent alone. but that's just my opinion. Anyways...I want Rohan to win, I think he's a great singer whose shown the most improvement...or Tanmay cause he's just so darn cute!! I found this foto of 'Bal' Suresh:). Oh, how could I forget to mention the part which left me laughing out loud.As Anamika started singing 'Gali mein aaj chand nikla', the camera panned on Suresh's head, and the light falling on his head made it look like a chand:). Sonu sure loves all kinds of comedy and jokes. He seemed to be enjoying himself. I really, really think Aamir is fab. He didn't deserve the baggin' from Sonu. Perhaps the next topic for discussion can be "The several sides of Sonu"... he comes across as quite agro sometimes. Mindrush I have been discussing this with my music-friends since some time.I think its to do with the diet. Keralites have a similar diet-pattern (fish etc) and they also sing very well(Yesudas, Chitra, our own Padma Wadekar).That doesnt mean people from other regions sing badly.Its just a similarity I found. Seamstress, Sonu wants his son to be well-mannered. Raju Srivastav eh? Thanks Sidekick I had no idea who that dude was inspite of having seen him before on NB. anu g, I love fish and rice and my voice blows chunks! who else are from there? did anyone notice that Head's little ponytail made an appearance this weekend on the show? I think it was the religious show. anyways, i dont think Sonu was too harsh with Amir. I think the way it was portrayed on TV made it seem so much worse, with the black and white flashes and that annoying music. And I wouldn't be surprised if it was edited to remove some parts! Bella, I agree.Editing can change the whole effect.I had my own few minutes of fame some years ago on a tv programme. The host and I chatted and he was teasing me about a few gaffes I made while trying my best to speak in shudh hindi. But when it came on air, I was horrified cos I came across as this very serious and stern person.I got calls from my husband and cousins and in-laws asking why i was so nervous? It wasnt all that bad, but with the editing, it didnt look great.Sigh!I am very happy to be here as a non-entity.Well, I seem to have drifted away,I agree that editing, as well as showing a black and white moment again and again with dramatic sound-effects, can definitely make a different impact. Ok, Aspi, there r always exceptions to the rule....Bengalis and Keralites have lovely eyes, and long hair too,I think its the fish. But i fit into this category...I dont eat fish, and I dont sing well. So there! My BH and I always discuss about the talent pool (actors, directors, writers, models, singers) in Bengal. Bollywood has had a plethora of bengali talent. Even Shaan who I thought was a muslim when he came on the world stage, turned out to be a true blood mukherjee. I believe the culture over there is more accepting and encouraging of other professions. anu g, you were on TV! No online links? We could all review it here. Heh heh. Come to think of it gujjus have a tremendous talent pool as well. First, we have Himesh. We have Naresh Kanodia who is the Rajnikanth of Gujarat (albeit like on pot). Our most famous actress turned out to be a southie so can't claim that one. And then there's that dude on Dhoom Macha De who has been flying the gujju flag really high these days. Must remember to write about him. Great write up Aspi. How did you miss out our very own Shekhar from the Gujju Talent Pool? 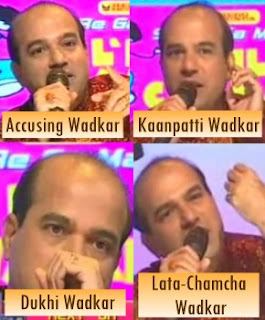 Lil champs is gettting boring - my fav Vasu is out and the rest are very inconsistent except Anamika. oooh...almost forgot Paresh Rawal...and the hottie from way back when...Asha Parekh!! Review it here?Oh, Goodness! Thank God, it didnt have an online version. (atleast I hope so). Well, yes, and I think most of the tv serials have gujju actors and actresses.So thats a long list. I can see Aspi beaming:). Wah, what a great list of awesome gujjus. How about the greatest Gujarati actress of all-time: Tina Munim! I had a crush on her when I was younger. Much younger. Upen Patel - its like as if Will Ferrell went to Chippendale's for higher education. LOL Aspi!!! I dont even consider Upen Patel a celebrity...he's just enjoying his time in the lime-light right now! Indeed! Haribhai was a particular favorite with Mum. There is a wonderful send up of name changes such as these in Om Shanti Om that I really enjoyed. The spoiler says Amir has been eliminated this week. (I am not sure how accurate this is though). I do feel bad for him. (as I have for almost every contestant on this kids show) But then he has to consider himself lucky, he has got a Bollywood break.And more importantly,Sonu was mentioning that someone has offered to sponsor Amir until he grows up and settles down in life.So theres no reason to be upset I guess.Hope he imporves his singing skills and grows up to be a famous singer. 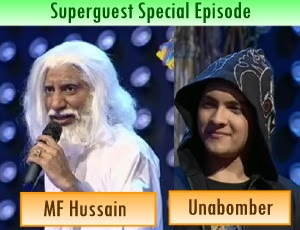 Ok, so its confirmed....and there was a big hungama after his elimination. Sonuji, point to note! !No females involved! HAHAHAHHAHAHHAA....Whoever did the Shekhar bits...man thats HILLARIOUS!!!! man Shekhu....'god bless' ur non-stop chadhti jawani!! !LMAO!